St Osyth Beach, Jaywick, looks better in the morning light. The karaoke pub is not functioning at this hour and there are young families and older couples enjoying the early morning seaside air. 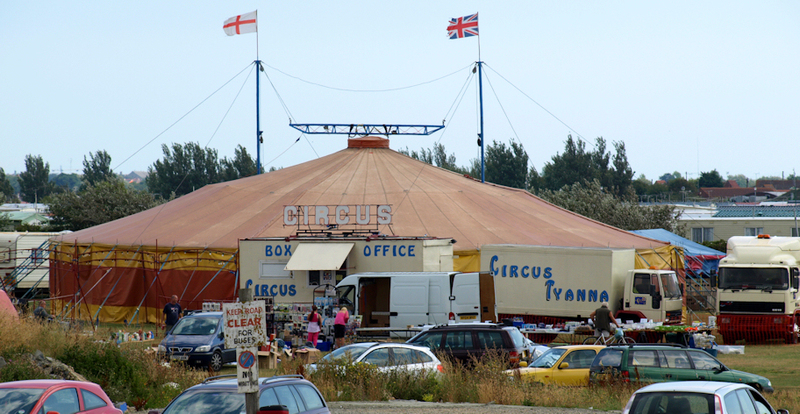 There is a circus here today – with tents laid out in a nearby field. I walk along the seawall, heading westward to a place marked on the mark as Lee-over-Sands, at Colne Point. The foot path follows a raised bank, someway inland from the beach. 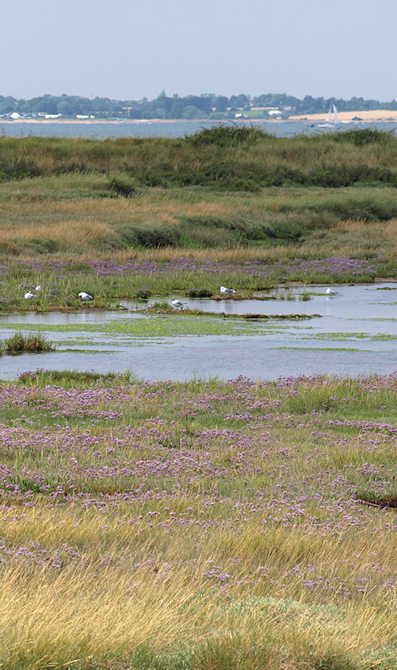 Between the beach and the path is a marshy area. Then I notice some signs informing me this is a naturist beach. I see a few distant figures on the sand, but cannot make out if they are wearing clothes or not. Beyond the beach, out to sea, I notice a beautiful red-sailed boat, making slow progress in the light wind. As I walk, I keep pace with this ship and it becomes my constant companion on this stage of my journey. The sea wall path is well-kept and I make good progress. But Lee-over-Sands is a disappointment. The houses are rundown with an unloved feel to them and gardens cluttered with broken toys and discarded furniture. There is an abandoned house, collapsing in ruins, just adjacent to the path. At Colne Point there are signposts declaring this is a nature reserve. Maybe it is the time of year, but I see little evidence of anything interesting in this dismal place. There is a solitary car in the car park with a woman reading a newspaper. Otherwise there is no sign of life. I am glad to leave Lee-over-Sands behind, as I follow the bank and head northwards. Now the path is overgrown with grass. I cannot see where I put my feet and I suffer my usual anxiety about snakes and, the more real danger, of twisting an ankle. To my left is reeds and marshes with water birds and, beyond the marshes, I notice the red sailed ship has rounded Colne Point and is sailing parallel to my path again. To my right are farmers fields and, as my nose identifies before I actually see it, a sewerage works. The path becomes even more overgrown. I come across a sign giving information about the nature reserve and showing a map with various walking routes. I was expecting to leave the bank at this point, but the nature reserve map indicates that the way ahead along the bank is a “permissive footpath”, meaning that I could continue along the bank, even though this is not an official “public footpath”. I would like to continue, but the path at this point is very overgrown with grass and I realise my progress would be very slow and difficult. 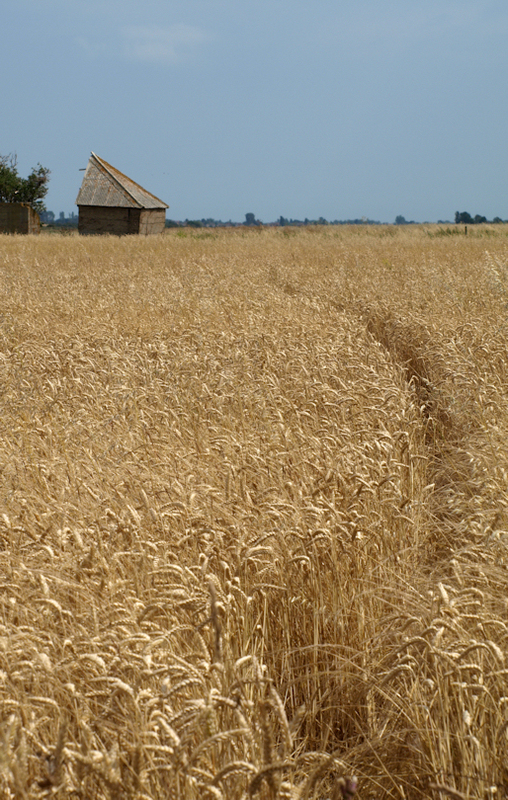 I make a decision to leave the bank and follow the official public footpath as it heads inland across fields. I pass men clearing out a ditch, the first people I have seen since the woman in the carpark. My footpath becomes a narrow trail through high corn. Luckily, people have passed this way before and the route is visible – just. After a while, I realise I have lost the path. No matter. I follow wide farmers tracks along the edge of fields and end up, eventually, rejoining the official path at Wigboro Farm. I smell the farm before I see it. Now I walk along tracks and join the road that leads into Point Clear. Point Clear is a largish village and there is no sight of the sea, until I round a corner and find a footpath that leads down to the shore. Here is a small beach with families out enjoying the sun and sand. Houses line a narrow promenade that runs along the edge of the beach and signs indicated that this is private property, over which the owner allows right of way. I am grateful to the owner for this privilege, but I am forming the firm opinion that sea access should always be a public right. I know there was legislation planned to create a coastal walk around England and I hope the new coalition government will continue this scheme and allow this legislation to pass through parliament. Growing tired, I am looking forward to finding the pub, marked on the map – the Ferry Boat Inn. The path rounds a corner and here is Stone Point, with a muddy beach, a car park and an estuary with moored boats. Across the water is Brightlingsea, where I see modern houses have been built and there is a buzz of activity as boats come and go and holiday makers wander close to the shore. Eventually I find the pub. It is a low, rather unattractive building. But the garden is pleasant with shady umbrellas and the food is very cheap. My husband joins me, having cycled here. After a leisurely lunch, we make our way to the shore. 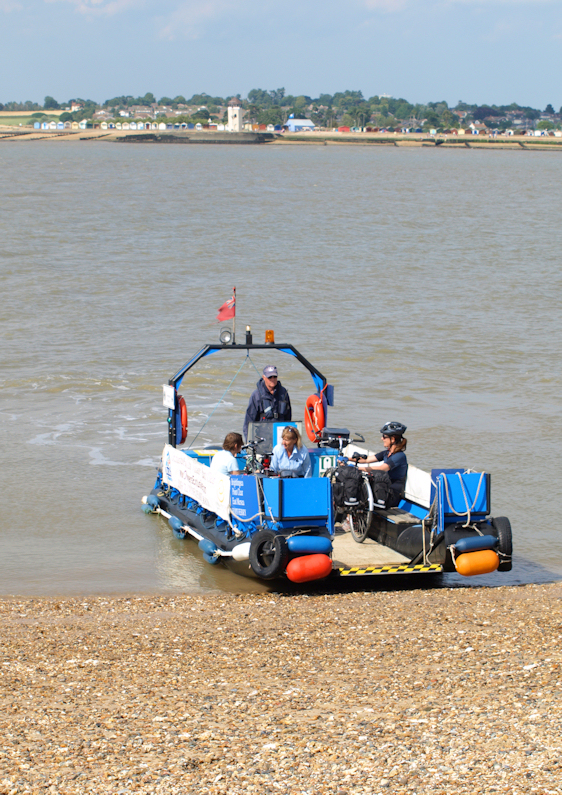 From my research on the internet, I know there is a small passenger ferry that will take us across to Mersea Island – and it will take bikes too. I have been instructed to phone up when I need the ferry and they will come and collect us – a wonderfully informal system. I hope it works. I find the number on a piece of paper in my rucksack and punch the number into my mobile phone. “Ferry,” says a male voice. My heart sinks. This dial-a-ferry notion seemed too good to be true. “I’m sorry,” I say and hang up. Now what do we do? 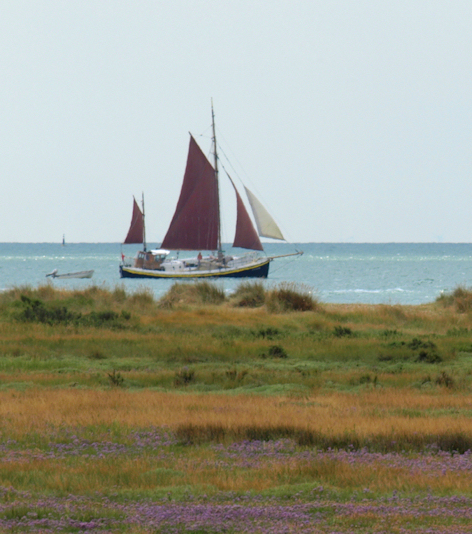 It is a very long walk by land and we have bed and breakfast accommodation booked on Mersea Island. Then I look at the paper again and realise my mistake – I phoned the Ferry Inn Pub – not the real ferry. I dial the right number and get a far more helpful reply. Yes, the ferry is on its way. We watch the ships coming and going as we wait on the shore. There is nothing to indicate that this is a ferry stop and I hope we are in the right place. A small boat chugs by with a man in brown uniform sitting at the tiller and the words “Harbour Master” painted on the side. Later it returns towing a small sailing ship with a man and his son aboard. The young lad is looking in admiration at the harbour master. His father is sitting sullenly with arms folded, obviously wishing he was somewhere else. I wonder what calamity befell this outing and resulted in this unwanted rescue. A large boat appears. It has come from the offshore wind farm and carries workmen wearing safety helmets. They yell at a yacht moored on a wooden pier – “Hey, that is our berth.” The young men on the yacht ask how to secure a berth and one of them takes out a mobile phone as the workmen dictates a number. They cast off and move away, allowing the tug to dock. We watch as a small motor boat comes alongside an elegant yacht. The man on the boat throws a line to the crew on the yacht. With the line stretched taut between them, the small boat begins to move backwards from the yacht, its small motor churning up the water in a frenzy of effort. What are they doing? Then we realise – the yacht is listing badly and appears to be stuck on a submerged sand bank. After a brief period of straining, the yacht suddenly lurches and then glides gracefully forwards. Success. It is free. Then we spot a small craft heading across the channel from Brightlingsea. Ah, here is the ferry. It is an ugly little beast of a boat, but we are pleased to see it. The ferry manouevres so that its back end is beached on the muddy sand. Then there is a whirr of motors and the back panel of the boat lowers itself downwards and outwards to form a ramp. This gives access to the inner part of the boat, an uncovered area with two benches facing each other. We take our seats, my husband balancing his bike across his knees, and head off. There are 8 other passengers and, strangely, there is a “stewardess” who ushers us onboard and sits with us. The pilot is perched high above us and concentrates on piloting the ferry through the mass of moored ships. To my surprise, we head back to Brightlingsea, instead of towards Mersea. I gather from the “stewardess” that there were more people waiting on the jetty than could be accommodated in the ferry. Why are we going back? As we approach, I see a queue of people waiting. They look at us with anticipation, but their faces fall when they realise the ferry is full. “What is going on?” The stewardess realises we have made a mistake. The captain assumed we wanted to cross to Brightlingsea. We pull away from the crowded jerry, leaving the disappointed would-be passengers behind. We head out across the open water and the sea becomes rougher as we leave the shelter of the river mouth. Waves splash up over the edge of the boat and we dodge to try and avoid getting wet, laughing as we get soaked by spray. As we draw near to Mersea Island, I see we are going to pull up on a beach, where the sand rises steeply up from the waters edge. There are a number of people on the beach, enjoying the late afternoon sunshine. They seem surprised to see this strange little ferry rise up onto the beach. We disembark quickly and I take some photographs as a couple of cyclists wheel their bikes up the little ramp and sit in our empty places, ready for the journey back to Brightlingsea. We are excited to be on the beach of this unfamiliar island. I notice the beach is covered in shells. When we reach the grass at the edge of the beach, I part company with my husband. He follows the path inland to resume cycling. 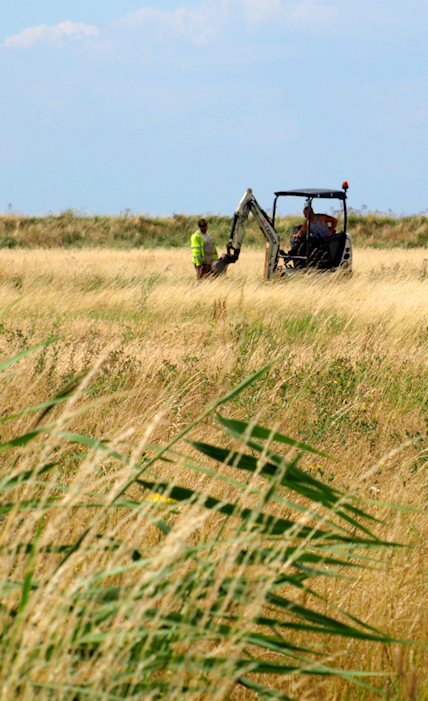 I continue following the beach, heading westwards along the shore toward the town of West Mersea. There is a low cliff, crumbling, to my right. To the left, the beach turns into mud and I see a network of groynes stretching out towards the distant water. Another attempt to prevent erosion. This area is a nature reserve with free access for roaming. For the next few miles I see very few people. In the distance I see large tents in a field. Drawing closer, I walk past a camp site where young people are marching and shouting. I am surprised by the noise and the chants – but it becomes clearer as I draw near. “Who do we love?” shouts a young man at the head of a group of younger teenagers. I walk along a concrete sea wall, past the religious youth camp, then past a caravan site and finally reach the outskirts of West Mersea. Here there are the most attractive beach huts I have yet seen. They are painted in pretty pastel colours and have small balconies. In this beautiful, late afternoon sunshine, most of the huts are in use. Children are playing while the adults are lounging in chairs. There is plenty of eating and drinking. I feel tired and hungry now. The sun is sinking lower. There is no esplanade, just the huts and a glimpse of houses behind the huts. Am I in West Mersea? I consult my GPS app on my iPhone. Yes, I am adjacent to the street where our B&B is situated and, reluctantly, I leave the beach and head into the town. That evening, my husband and I walk along the road that runs beside the sea, the “Hard”, and find an unprepossessing shack that offers sea food to eat in or take out. We sit outside and watch the sun set over the estuary and the moored yachts. We eat crab risotto and scallops, washed down with dry white wine. Just after the sun sets, a full moon rises. Moonlight glimmers on the water and lights up the rigging of the boats. Magical. Milestone! This is the first walk I started and completed with no blisters. This entry was posted in 04 Essex and tagged beach, beach huts, Brightlingsea, britain, british, coast, coastal, coastal erosion, cycle, cycling, cyclist, england, Essex, ferry, Mersea, path, photography, Point Clear, seafood, shells, walker, walking. Bookmark the permalink. The permissive path you found along the sea wall through the nature reserve is interesting. 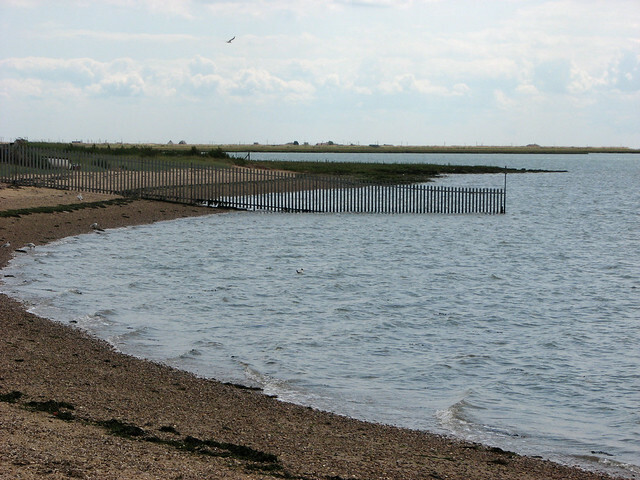 I came at this stretch of coast from the other direction and found that from St Osyth the beach was blocked with a heavy-duty fence so concluded there was no way ahead and headed inland along the same path you used. So I suspect if you had have followed it, you would have had to turn back unless there was an inland route that went around the fence somehow. Hi Jon. Wow, that’s an impressive fence. Glad I didn’t continue along the sea wall as it would have been very frustrating to be forced to turn back, particularly as the going was tricky underfoot.